This recipe for Irresistible Spiced Apricot Mustard Glazed Ham will take your holiday glazed ham to epic proportions, and with hardly any effort. 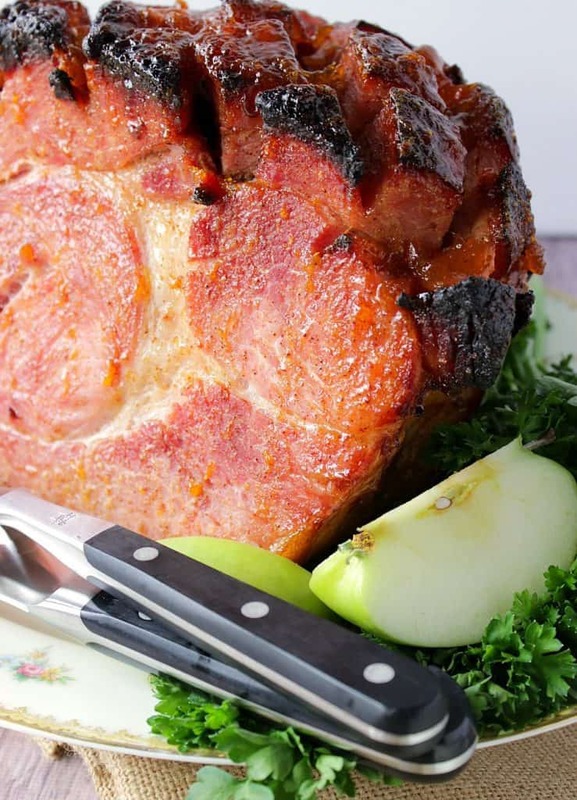 This spiced apricot mustard glaze will work well for all type of hams. The completed recipe I’m showing in the photos today is with a 9-pound bone-in ham that isn’t sliced. I scored the top of the ham in a diamond pattern with a sharp butcher knife so that the thick mustard glaze would seep into the scoring and flavor the interior of the meat. **Please Note – The printable recipe card with detailed instructions, complete ingredient measurements, and nutritional information for making Spiced Apricot Mustard Glazed Ham is available near the end of this post. A Spiced Apricot Mustard Glazed Ham is an Easter holiday classic! 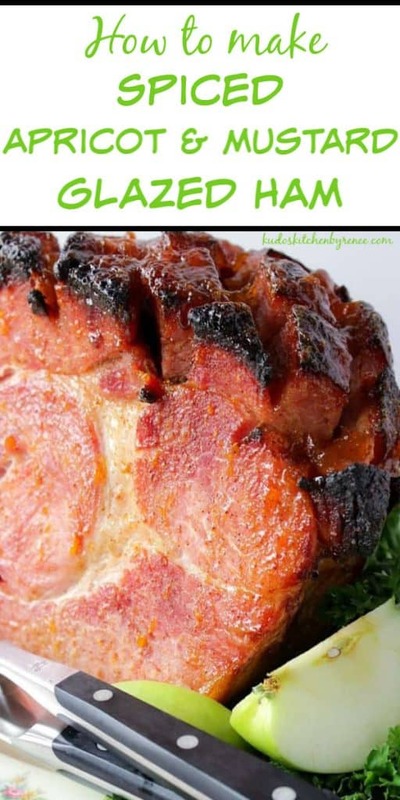 This glazed ham recipe is one of our absolute favorites! It feeds a crowd and is delicious for celebrating any multitude of occasions throughout the year. 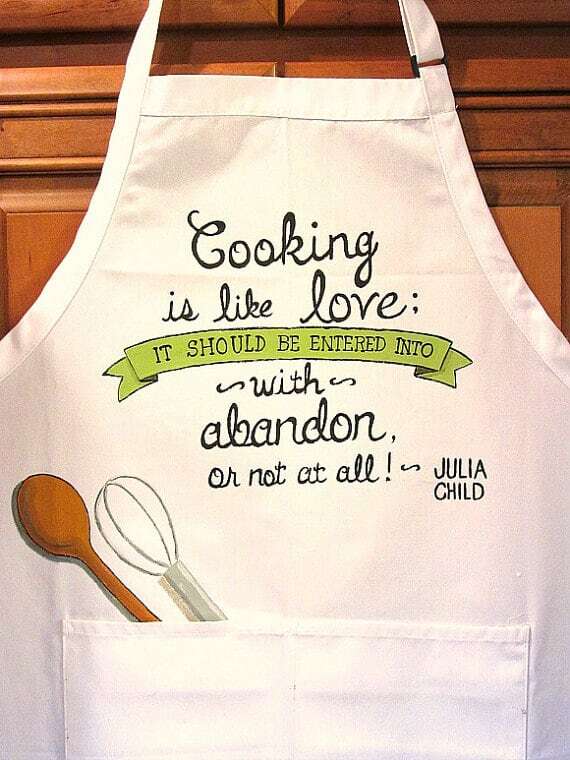 I’ve made it for Christmas, New Year’s, and of course, I’ll be making it again for Easter. Can I make this apricot mustard glaze and use it for a spiral cut ham? You can, and you should!! 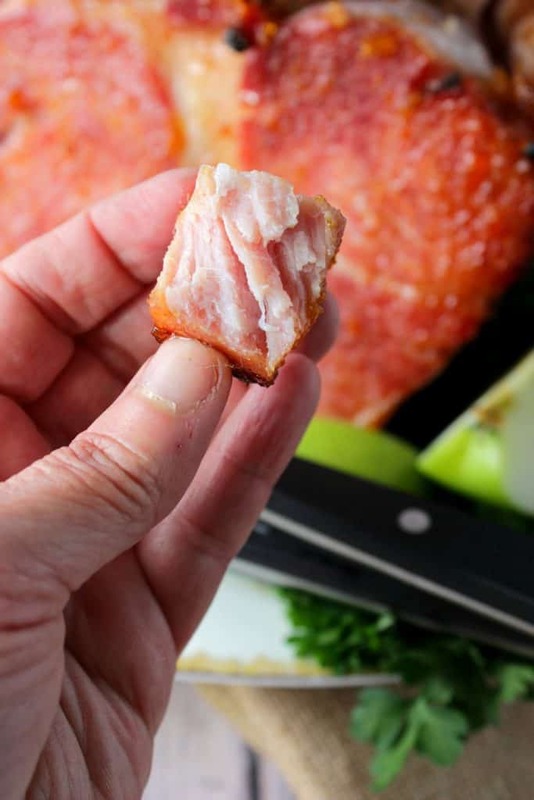 Dispose of the little packet of ham glaze that comes with some brands of spiral cut hams (those are all preservatives and sugars) and make this easy ham glaze instead! It’s quick, delicious, and everyone loves it! Can this glaze be used on chicken or pork chops? You may also want to use it for fish or as a dipping sauce for breaded shrimp. What are some recipes ideas for using leftover ham? 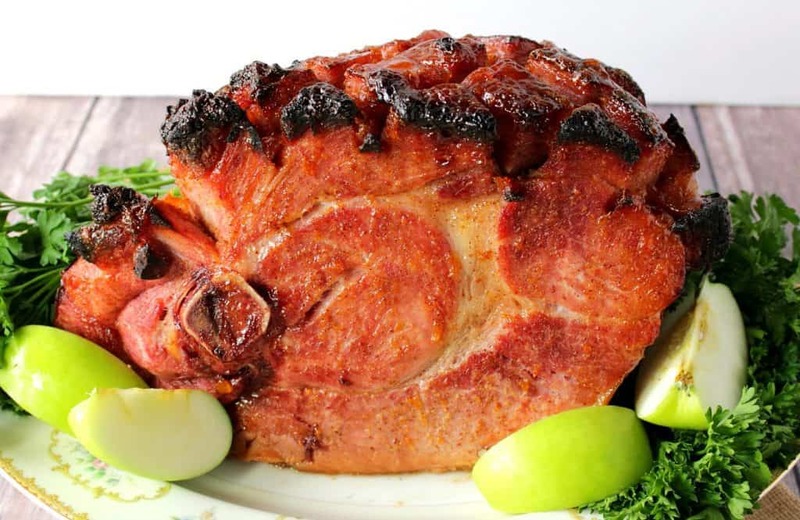 Place the ham in a baking dish and score the top with a sharp carving knife in a diamond pattern, about 1″ deep. *Note – skip this step if using a spiral cut ham. In a medium-size bowl stir together one jar (18 ounces) apricot preserves, ½ cup deli-style mustard, 1 tablespoon ground ginger, 1½ teaspoons ground cloves, and ¼ cup pure maple syrup. Liberally spoon half of the glaze over the scored ham. Pour ½ cup of orange or apple juice in the bottom of the roasting pan. Roast the ham in a preheated 425-degree oven for 50 minutes. Remove the ham and liberally spoon the remaining glaze over the ham. Reduce the oven temperature to 350-degrees and return the ham to the oven for 45 more minutes. Cool slightly, slice and serve. What to do with the leftover ham bone? When cooking a bone-in ham, I suggest that you don’t throw the bone away after you’ve carved and served the ham. Wrap it tightly in foil or plastic wrap and stick it in the freezer for when you’re going to make bean or pea soup. 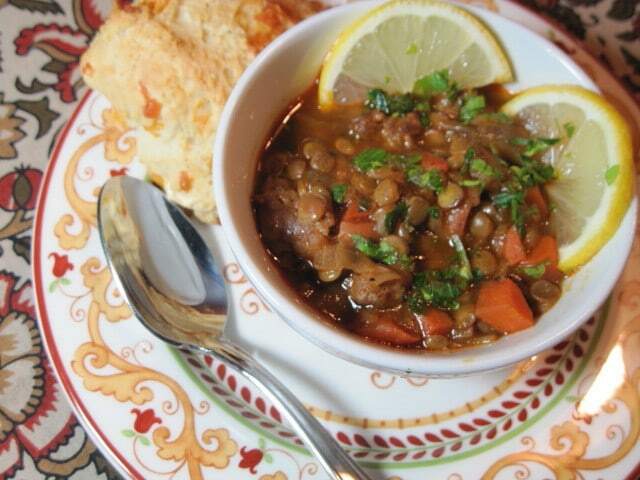 The ham bone will add extra flavor to your soup or stew. 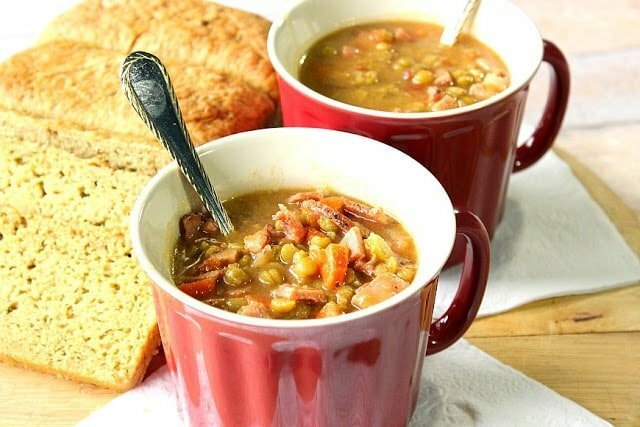 Also, if you have any leftover ham, it’s always a good idea to freeze some and add it into the pot for extra meaty goodness like my Slow-Cooker Split Pea Soup with Ham. 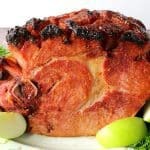 The following Amazon.com items are some suggested products I’ve chosen that will aid you in the making (and serving) of this recipe for Irresistible Spiced Apricot Mustard Glazed Ham, if needed. 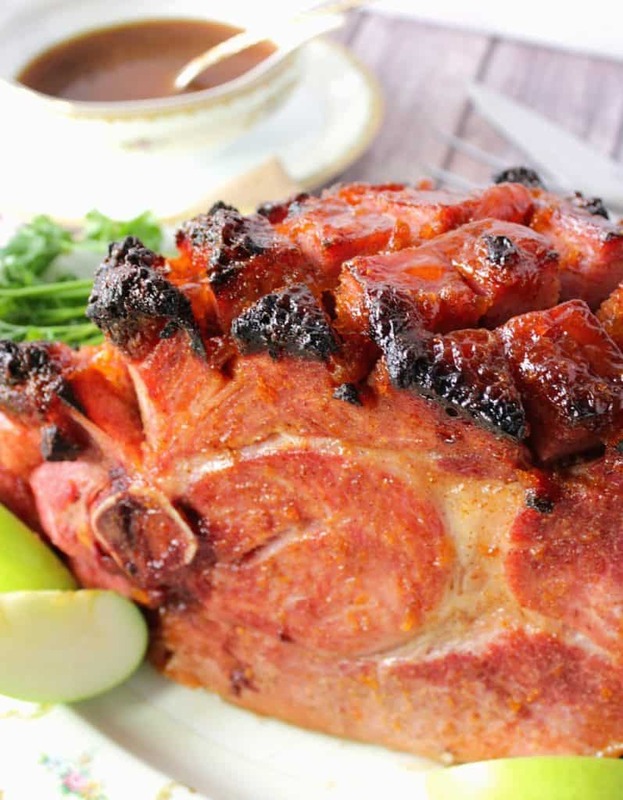 This Spiced Apricot Mustard Glazed Ham will be one of the best hams you’ve ever eaten! Below is the printable recipe card for today’s Spiced Apricot Mustard Glazed Ham. This recipe for Irresistible Spiced Apricot Mustard Glazed Ham will take your glazed ham to epic proportions, and with hardly any effort. Score the top of the ham all over with ½" deep slices and place in a deep roasting pan. In a medium bowl stir together the apricot preserves, mustard, ground ginger, cloves and maple syrup. Spoon half of the glaze over top of the ham. Pour the juice in the bottom of the pan. Roast the ham in the preheated oven for 50 minutes. Remove the ham and slather on the remaining glaze. Reduce the oven heat to 350-degrees and return the ham to the oven to continue cooking for 45 minutes (cover with foil if the ham is browning too deeply). Remove the ham from the oven, cool for 15 minutes before slicing and serving. I have a confession to make. Once I started eating this ham (for photo purposes only, mind you, LOL), I literally could not stop eating it. It’s so flavorful and moist. It’s completely irresistible, which is why I named it Irresistible Spiced Apricot Mustard Glazed Ham…because it truly is! I sincerely hope you’ve enjoyed today’s recipe for Spiced Apricot Mustard Glazed Ham as much as I’ve enjoyed bringing it to you! Great flavors here! Beautiful pictures too. That means a great deal to me. Thank you! I love these flavors!!! This will perfect as the centerpiece of a big Easter dinner! It really will. Glad you like it! I absolutely love this flavor combination. 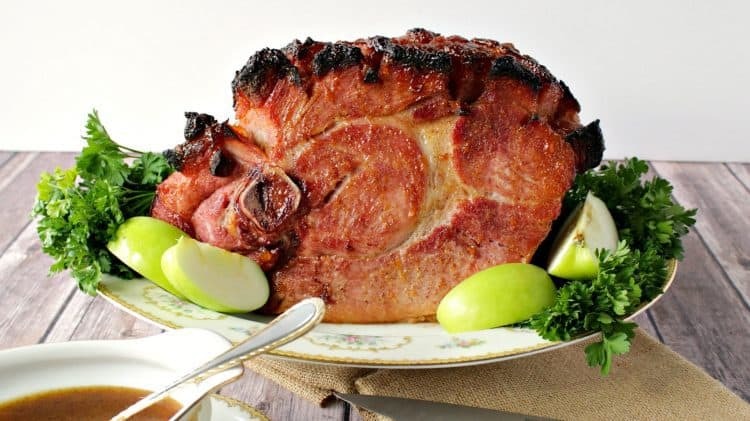 A perfect ham glaze for Easter or any holiday. Thanks for the great recipe.